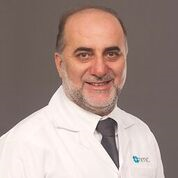 Dr. Adbul Latif Araji obtained his MBBS from University of Bucharest, Romania in 1987 and obtained MD in General Surgery from Postgraduate Medical School, Budapest in 1992. Dr. Abdul Latif has vast experience in working many reputed hospitals in Lebanon and UAE. He was the Medical Director of Farahat hospital and Naser hospital in Lebanon. Later he became Specialist in vascular surgery in Tawam and Al Mafraq hopsitals, Abu Dhabi. Dr. Abdul Latif can speak Arabic and English.